As an ethnographic art collector and dealer, Ric spent much of his time traveling in remote areas of South America gathering material from indigenous riverine and coastal tribes, targeting mainly ceremonial pieces used in their religious and healing ceremonies to sell to museums and collectors around the world. This book, Part 1 of a series, recounts his experiences traveling island to island throughout the San Blas archipelago of Panama in his 45-foot-long dugout canoe, Don Tiki, and the many adventures and mis-adventures he had there dealing with the Kuna Indians. 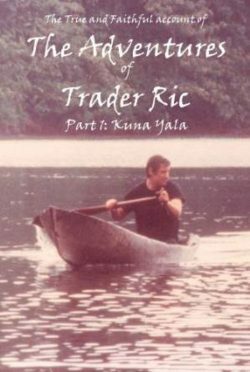 Ric brings the everyday life of the Kuna alive with his account of his island-by-island, hut-by-hut, search for material, all the while evading pirates, vampire bats, cholera, and even an angry crowd of Indians bent on revenge.